Web and social media marketers have been anxiously awaiting Google’s integration of tweets from Twitter, after a deal was announced earlier this year. Now, Google SERPs (Search Engine Results Pages) include Twitter accounts, with recent tweets and retweets shown. The Twitter results only show up with certain search phrases, and placement and results vary according the account holder. 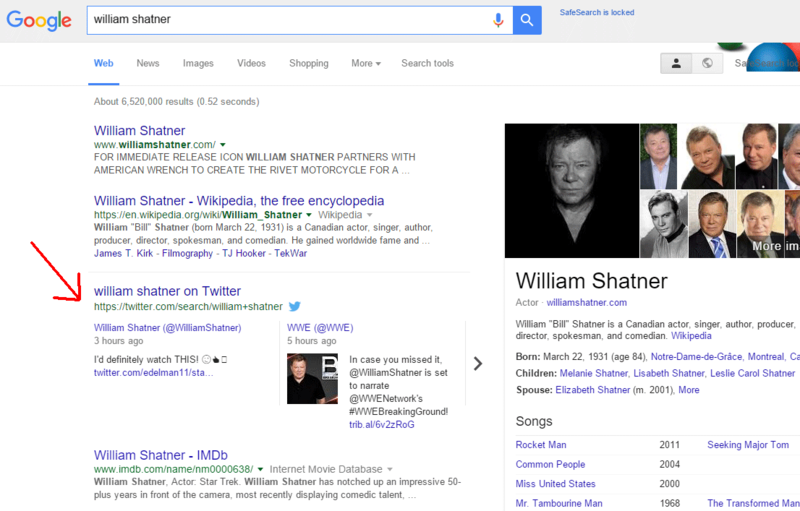 Take for instance this search for “william shatner” (shown above) in which his Twitter account shows up only his personal website (williamshatner.com) and Wikipedia page (a favorite of Google SERPs). What’s interesting is the Twitter account placement even comes before his IMDB.com listing (the authority on movies, TV shows, and actors), and before news listings. Another celebrity search using “amy schumer” turned up similar results, only that news stories showed up first and her personal website showed up fifth under her IMDB listing. Google is clearly ranking the .coms in different ways – probably in this case by age or PR ranking. A search for the company “pepsi” put their Twitter account third after pepsico.com and pepsi.com. And, a search for the popular action cam “gopro” put their Twitter feed below-the-f0ld after In the News and the company website. However, it’s the sponsored ads from both GoPro and other retailers that put the company’s Twitter account after the scroll. One thing is certain, if a company maintains a verified and active Twitter account it can lead to great traffic from Google search results, and an opportunity to build more of a following on the social media site that has changed how we communicate over the internet.